MCCA refers its products through a screening process that establishes the product’s ethical and moral viability. Our products are developed in conjunction with, and certified by, our Shariah Advisory Board to ensure that they adhere to the ethical principles outlined in the Shariah. 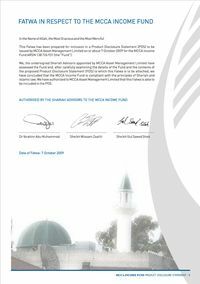 Our Shariah Advisory Board members are among Australia’s leading scholars. They include the Mufti of Australia Dr. Ibrahim Abu Muhammad, Shaykh Gul Saeed Shah and Shaykh Wissam Ahmad Zaatiti. We also continuously present our products to Shari'ah advisors abroad that have also endorsed our products. Some names amongst these include Dr. Muhammad Dawud Bakkar, Dr. Oussama A. El Rifai and Dr. Mabid Ali Al-Jarhi.